Saturday comes round and I get to fire another shot of brain waves and line drawings directly into the heart of the internet. 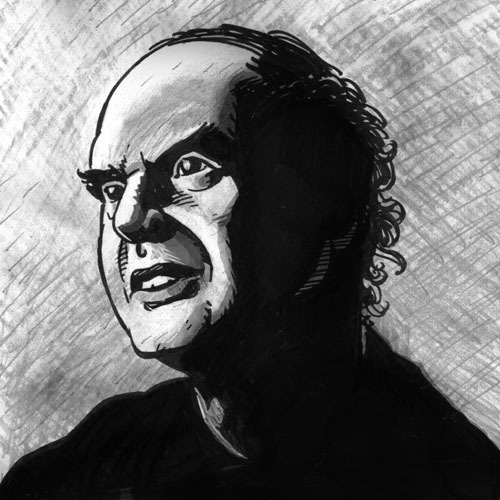 As everyone knows by now, the great Harvey Pekar passed away this week. I think the proper send-off is a comic story. That was Harvey’s way. Glad to have known you, Harvey. Extra glad to have worked with you. Such a flattering portrait I did for his 70th birthday. 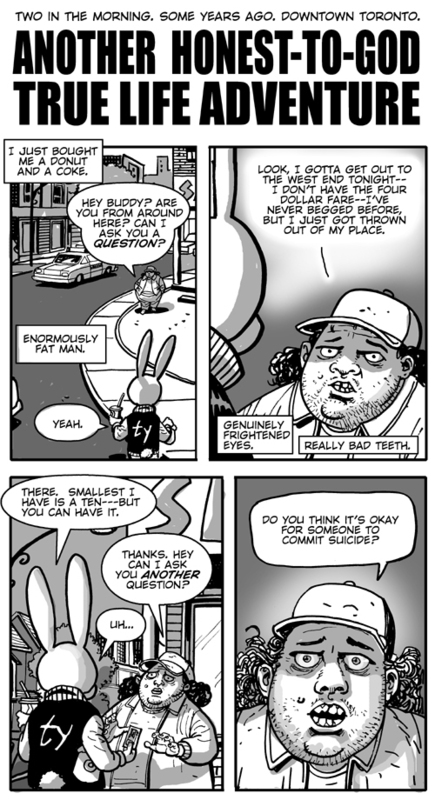 For last week’s BUN TOON, another exciting adventure in the life of EVERETT MANN: FREELANCE PROTAGONIST: go HERE. 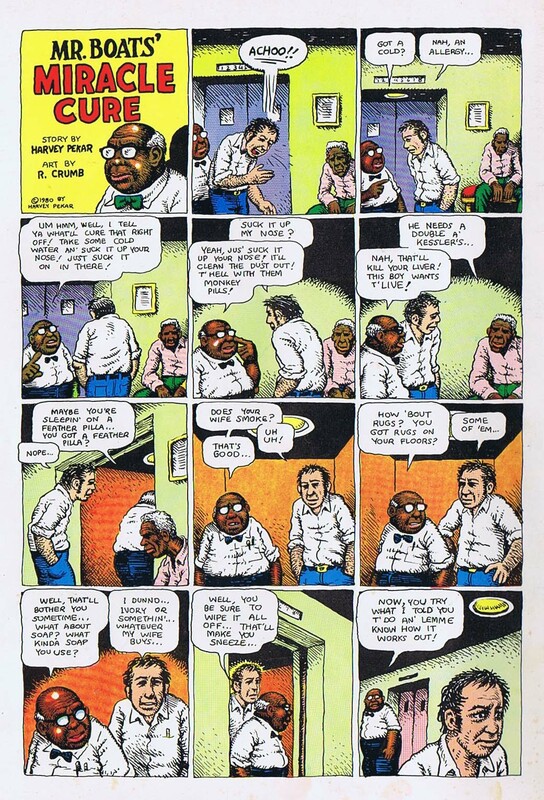 I first came across him as a teenager with issue #5 of his American Splendor (seen above) from 1980. That’s a scan of my copy, complete with Scotch tape over the place where I tore it some years ago. Torn comics are loved comics. I bought it because of my then-current drug of choice, Robert Crumb, with a cover and fifteen more pages inside by the underground master. With Mr. Fritz the Cat on board, how could whatever this was, not be worth it? And it was, from the moment I picked it up. It starts by dryly advertising sickness, old age, unfunny jokes, and a decrepit Jewish guy under a banner promising the splendor of Cleveland. That’s crack-flavored Kool-Aid to my sense of humor. But check out this bitchin’ back cover. 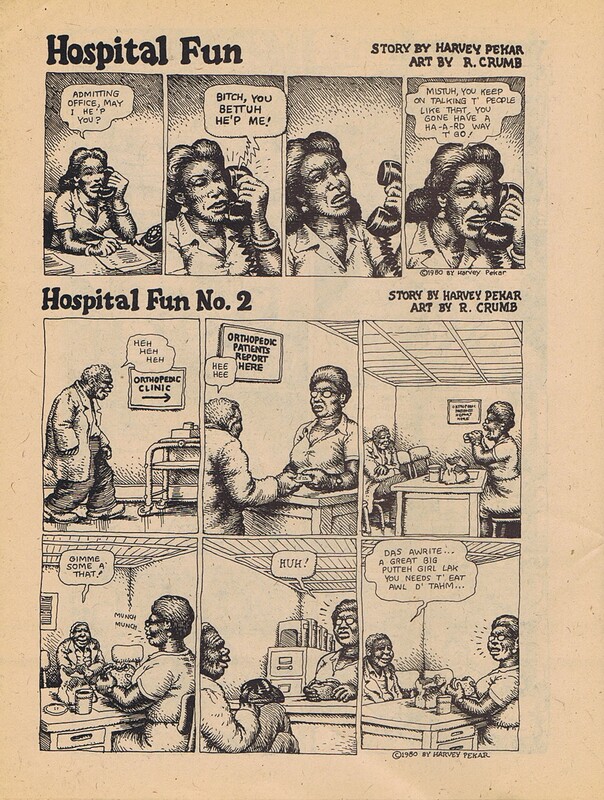 That’s the first Harvey Pekar story I ever read: Advice on how to avoid the sniffles while riding in an elevator – with a ending that strongly hints it WILL be continued next issue. At this point I’m berserk with joy, because I’m rocking a belief that this whole magazine is going to be some sort of wry put-on about boy’s own adventure stories…giving us “TALES OF THE STUNNINGLY MUNDANE”. But it wasn’t quite that, even if it seemed to many that it was. There was far more tickingin the brain of Pekar than that one-off joke. Inside were comics on the history of Cleveland neighborhoods, memories of a holocaust survivor, tales of manners and lending money, and the existential terror of hypochondria, all sprinkled together with these tiny comic snapshots that stick to one’s memory as the days trip by. To the very charming team of Budgett and Dumm. 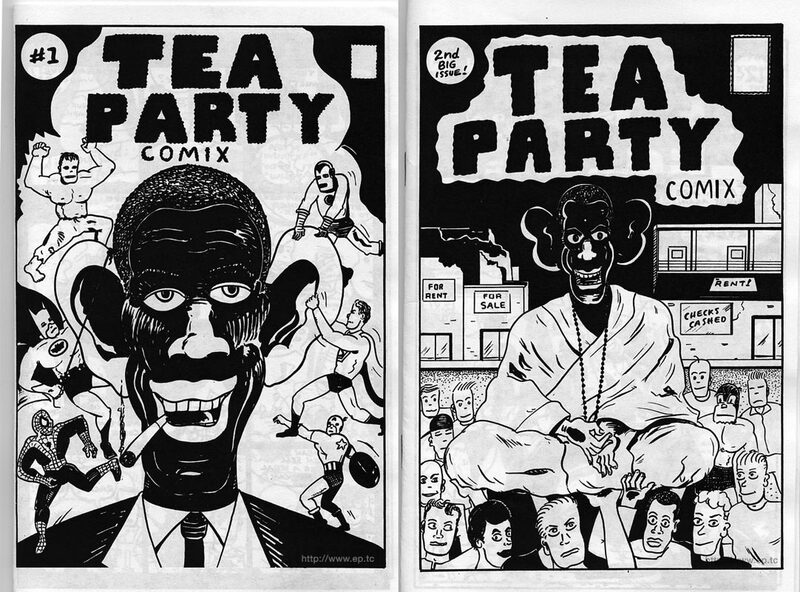 These three very different styles of art added to the perfect little package that this particular issue seemed to be. This stuff was like nothing I had every read in a comic book, or seen as entertainment anywhere, and I was junkie-hooked for life. 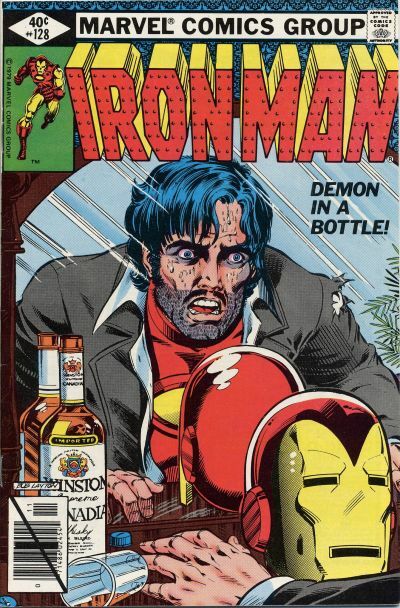 I mean, we did have “realism” in the comics at the time…. 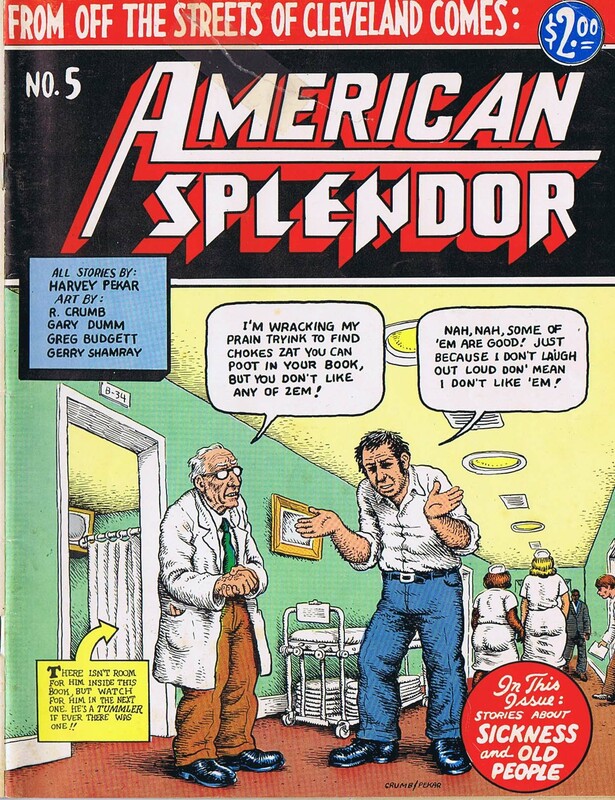 American Splendor #5 shared a newsstand with this Marvel Classic. It's getting real around here, man. Not just with superheroes, but also with the gritty, true-life “undergrounds”. This is too real man. Too f***ing real. 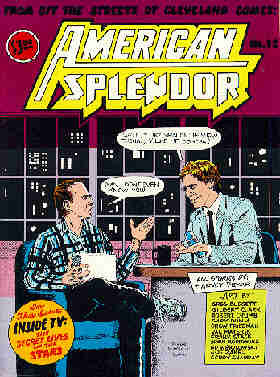 Nothing existed like American Splendor. It was part comedy, part Haiku, part journalism, and part self loathing confessional, all from the unlikely point of view of a V.A. Hospital file clerk in Ohio. And over the years, we got Harvey’s view on the history of Jazz, obsessive compulsive disorder, race relations, more existentialist fear, cancer survival, marriage and parenthood, growing fame and fortune, brutal honesty, and the occasional knee slapping joke. 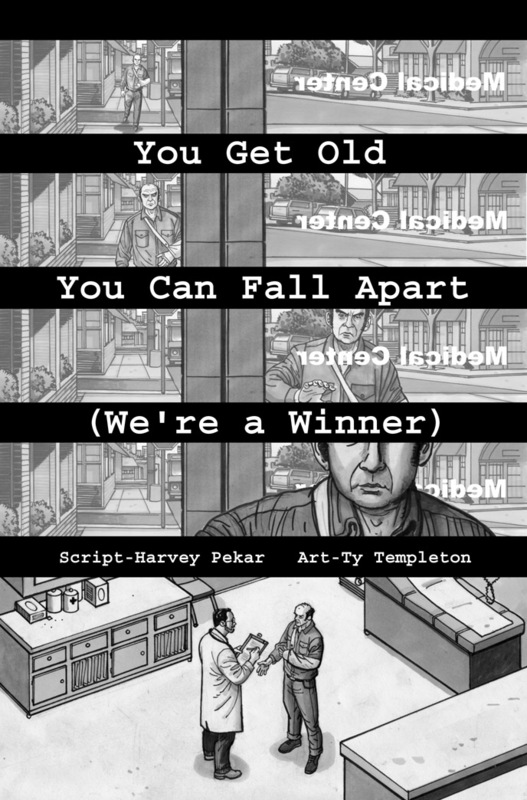 Harvey was a greater influence on my work that most people would guess, and if you read this webcomic (from just a few weeks ago), you’ll see what I’m talking about. For my answer, and the full story, click here. That particular webcomic got a very positive response, and I kept telling folks I hadn’t done much to deserve their praise…I simply transcribed a true story as honestly and as straightforwardly as possible, hoping to tug at your basic humanity a little. In other words, I just stole Harvey’s act. 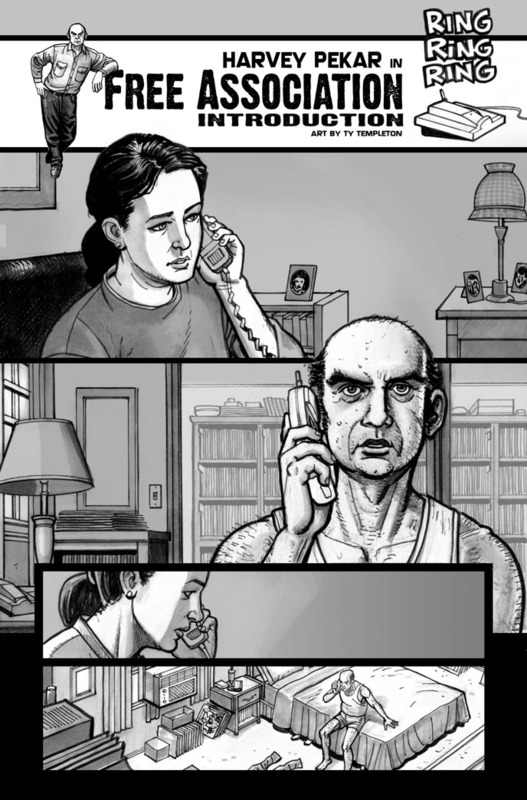 As I was writing this column, it occurred to me that the truly best way to tell the story of meeting and eventually working with Harvey Pekar, is in comic form… So I’m drawing it as we speak, and it will be ready for Saturday Morning with Bun Toons. Hope to see you there. I should not have waited to call him back. Words cannot describe the fun it is to get to work with one of your lifelong heroes. Literally a dream come true. 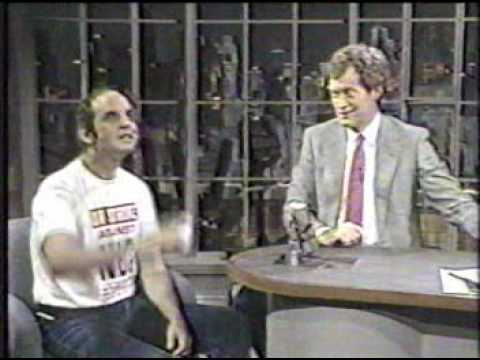 Back in the 80s, Harvey had a fan on the Letterman staff who booked our hero to appear a dozen times or so on Dave’s old NBC show. Harvey generally behaved in a very entertaining manner for a while, but as the bookings continued, he started to become quixotically obsessive about “outing” NBC as a front for the Pentagon war machine. Promise me you’ll head over to youtube, and watch this delightful battle of egos from the early days of colour TV and sound transmission. 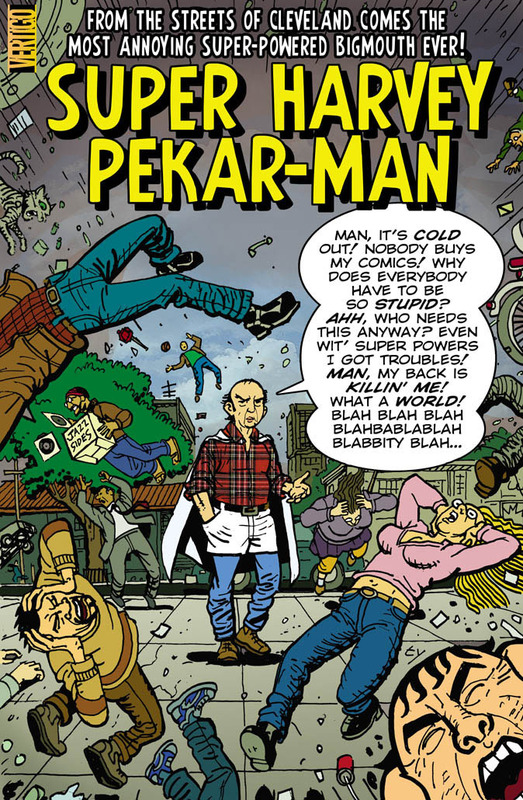 It’s a big part of why Harvey Pekar was the subject of a magnificent Hollywood movie about his life a half dozen years back. 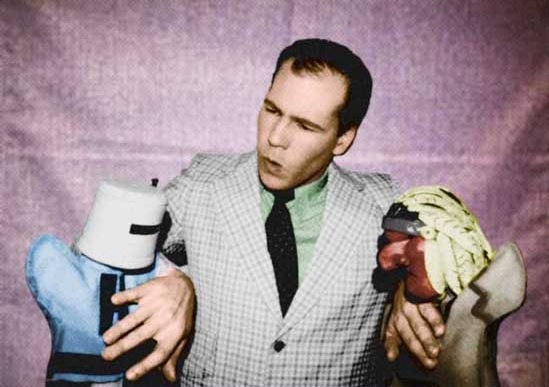 The Letterman appearances introduced him to a larger audience, and it made for phenomenally entertaining comics and TV. "You have crappy donuts in the green room, man"
See you Friday for a new and shocking HOVERBOY FRIDAY, and on Saturday for HARVEY PEKAR: CRABBY MAN-CHILD OF DESTINY! The Unauthorized Webcomic. 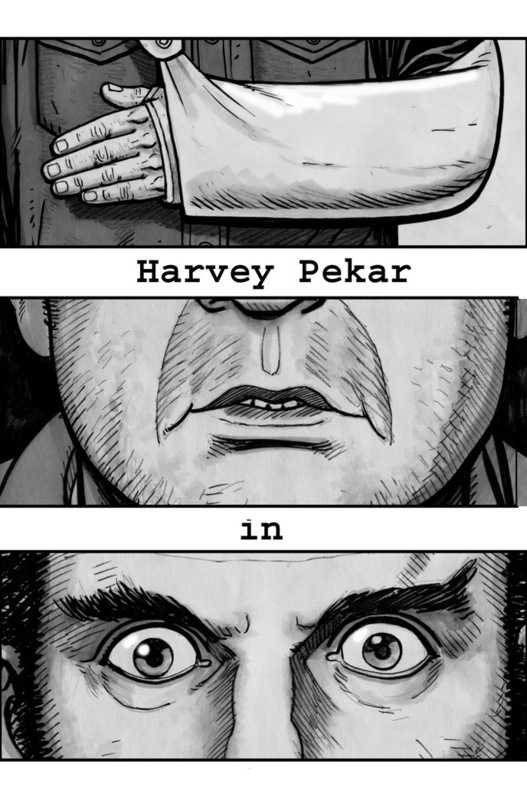 Harvey Pekar passed away very early this morning, I just heard about it now. 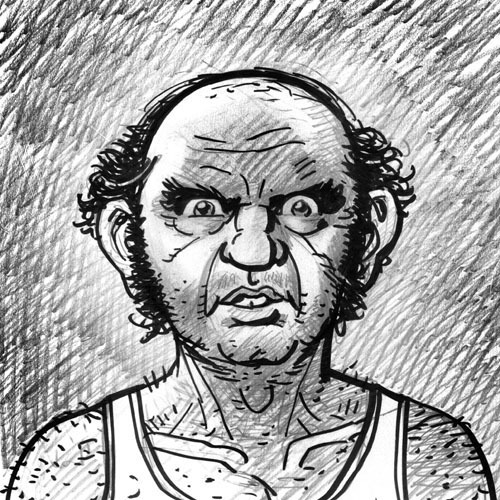 As anyone looking at the top of this blog will notice, Harvey Pekar’s face is staring out at my blog readers from a story Harvey and I did together a year or so ago. We did a few things together, and we were, at some point in the future, supposed to do some more. I’m afraid I’m not going to blog much about this today, because I need to take a day or so to digest his passing. One of my heroes, one of the most interesting people I ever met, and aren’t we all lucky that we got to know him, either through his movie, his writing or his simply being here, and loudly refusing to shut up. I’ll give you a proper send off in a day or so, Harve. Nepotism Thursday! Apples, Trees and Original Sin! It’s my son’s 14th Birthday today, so naturally it’s time for another “NEPOTISM THURSDAY!” (which falls on a Wednesday this month, quite common, I assure you). 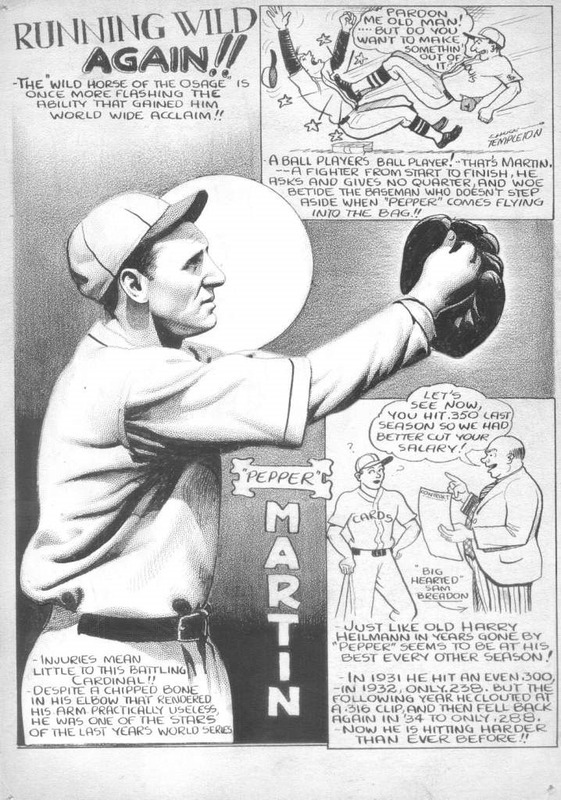 But because the kid’s going to get lots of expensive gadgets and free food later, I’m going to talk instead about the cartooning work of my father, Charles “Chuck” Templeton, and how far apples fall from trees. So THERE, beloved son! 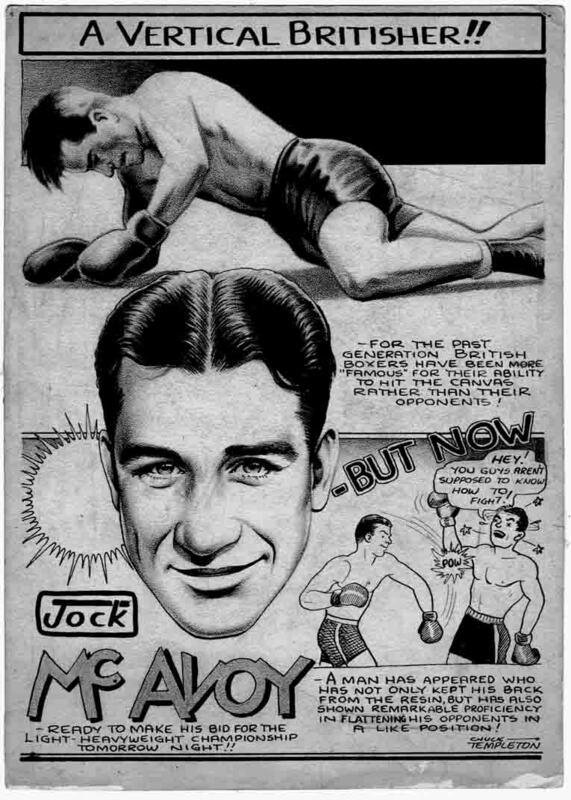 Just a quick tease this time out, with a couple of Dad’s sports pieces, scanned from the original art that hangs on my wall and from clippings…Chuck had a regular cartoon gig for the Toronto Globe and Mail in the 30s (*actually, when Charles was 17. By 21, he started his career as an evangelist. kts), for about four or five years in what was Dad’s early twenties. He drew mostly sports, and some political cartoons with both a remarkable skill for likeness, and a playful skill for comedy. I had no real sense of my father’s illustrating and cartooning work until after he died. And though he taught me one or two things about proportion and how to hold a pencil when I was very young, it was nothing like professional secrets or anything. And since his work was all printed and packed away decades before I was born, I saw almost none of it, until it was entrusted to me when he passed away. So, what that amazed me most about his work once I got to see a lot of a it at once, is that I see many similar things to my own style in there. Similar compositional methods, similar lettering even, and the basic skills are in the same zone, though in different styles for different generations. Considering how little he taught me about the biz, and how little of his work I saw growing up, how freaking odd that there are so many similarities. My parents were divorced, and I was raised by my mother, so it’s not a question of nurture… Is there a GENETIC component to an artist’s aesthetic? More of my father’s work to come in future weeks. I’ve got stacks of it, and much of it is very good. 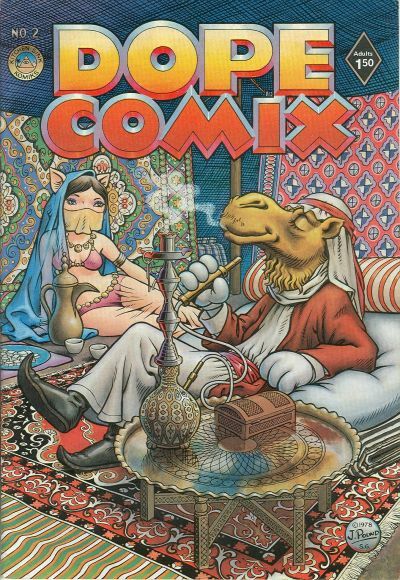 PLUS, it’s a nice slice of history for the Canadian Comics Corner buffs out there…including Mr. Pincombe. As for me, I’m off to teach my comic book bootcamp course tonight, and maybe buy my teenaged son a slice of cake, and sing. 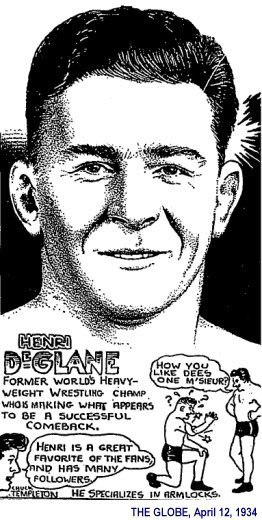 NEXT: How I turned down sitting on an upcoming panel with Stan Lee and Harvey Pekar next week, (I’m an idiot), and the stirrings of JOHNNY CANUCK! Oh, so exciting! There’s still a cover or two to show from the San Diego Comic Con Mad Magazine special edition…so I’ll be posting them to fill this space until Ty finds time (in between working on his new Mad assignment and prepping for today’s first class for the “Writing for Comics: Inspiration on a Schedule”) to rant all on his own. I’m back to threatening to follow him around with a tape recorder…he’s been reading a book about the early days of the National Lampoon (a magazine near and dear to Ty’s comedic heart) and giving me little mini-lectures about the history of the NatLamp, SNL, and the early days of Mad. You guys gotta hear some of this stuff! 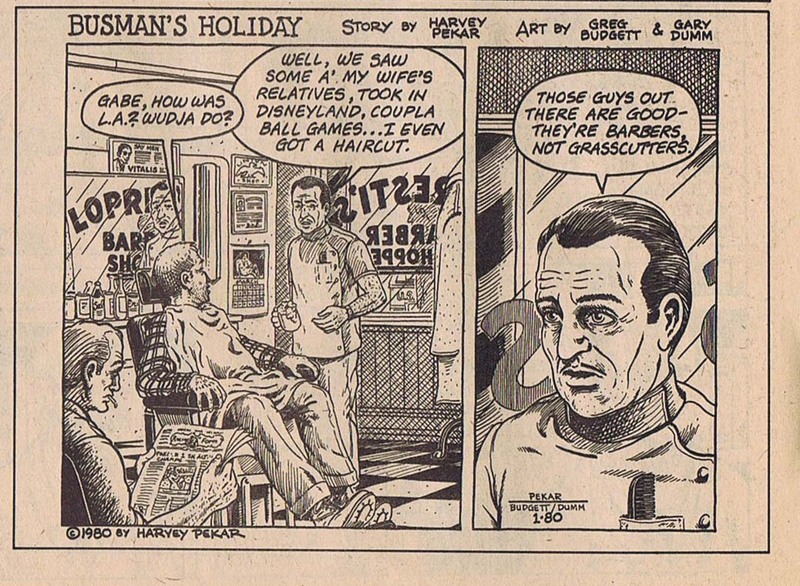 Ty drawing Harvey Pekar for Mad Magazine–he was pretty happy with this assignment. SOMETIMES, THE ROUGH…and another of the increasingly late Hoverboy Fridays! Clearly, I’m mad, I tell you. MAD. I’m one of those guys who spend their lives liking the rough sketch better than the final art. It’s a curse. I have a fondness for the scribbled, eccentric, humanistic and unembarrassed linework of a rough sketch. There’s a lovely connection to movement and thought in the first contact with the image to muscles and paper, often softened unbearably by turning it into a final illustration. As a professional drawer-boy, I’m always fighting between “cleaning it up” and “letting it live”. The Batman sketch from an old, old Adventures cover, (which I just found in a box yesterday, and hence this post) is less than three inches high. It’s drawn in pencil and a thick pentel marker which was clearly drying out, as the background becomes less dark to the right. But the sense of danger, the monster, and the expressions on everyone’s face works for me in a way the final doesn’t. My Pekar’s AMERICAN SPLENDOR work last year did the same thing to to me. I was going for a very sedate, “realistic” Curt Swan type of storytelling for Harvey, since that was the basic feel of this particular script…but the rough layouts had a Kirby-like energy to them, with a lively and playful sense of proportion that I wish had fit the story. Again, these layouts are about three inches tall, and the final art is fifteen inches high…so the movements of your hands vs. the movements of your shoulders are going to be different. 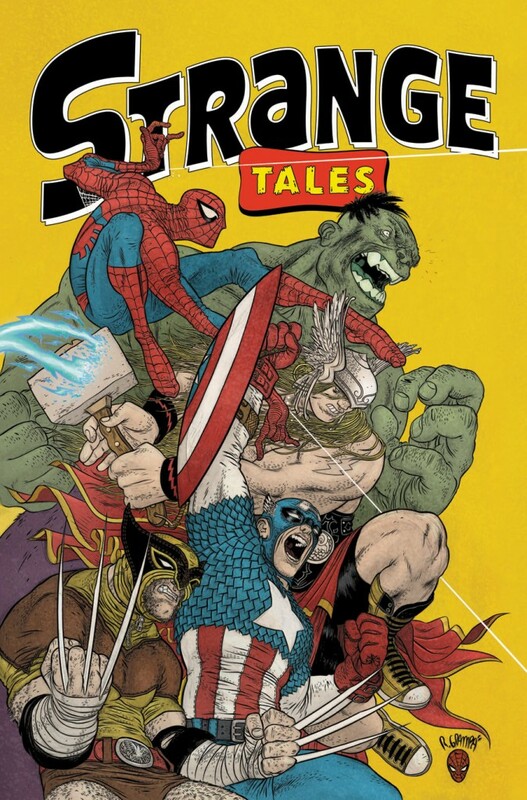 I just got through reading an issue of Marvel’s new “STRANGE TALES” comic, with folks like Peter Bagge, and James Kochalka doing very indy looking work on Marvel super-heroes. Astoundingly great fun, and some of the pages have the same feel as my rough pages do…before I clean myself up. 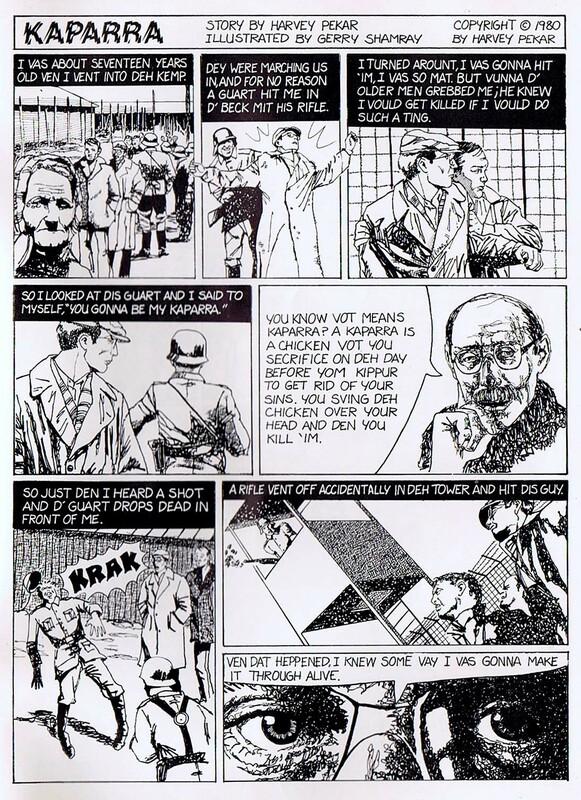 If only I hadn’t seen so much Harvey Kurtzman while growing up. I could rid myself of this demon of liking the roughs. FOR THOSE WHO DEMAND THEIR HOVERBOY FRIDAYS ON FRIDAY, I GIVE A FIE TO THEE! A FEE FIE! Hoverboy Fridays continue to wander the calendar, and we find one barging into Sunday. I’m only making this rare exception to move Hoverboy Fridays from its regular spot on Tuesdays, to this weekend, because the most recent update is topical! 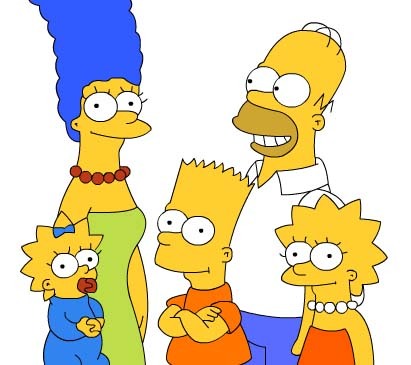 It has to do with Hoverboy’s very tenuous connection to Sesame Street, which celebrated it’s 40th, or 45th anniversary this week, I wasn’t paying enough attention when Wolf Blitzer mentioned it. Go to the Hoverboy museum and read more about this astounding connection between Kermit the Frog and The Boy Who Hovers. www.hoverboy.com (for those who don’t hyper link well).